↑ 1.0 1.1 "Provincial Election Results: Romblon". May 13, 2013 National and Local Elections. Manila: Commission on Elections. 12 May 2014. สืบค้นเมื่อ 18 September 2015. ↑ "Congressional Election Results: Romblon". May 13, 2013 National and Local Elections. Manila: Commission on Elections. 12 May 2014. สืบค้นเมื่อ 18 September 2015. ↑ "List of Provinces". PSGC Interactive. Makati City, Philippines: National Statistical Coordination Board. สืบค้นเมื่อ 31 January 2013. ↑ 5.0 5.1 5.2 5.3 5.4 "History" (PDF). Profile of Romblon Province. Romblon: Philippine Statistical Authority. 2013. สืบค้นเมื่อ 8 September 2015. ↑ "Location, Geography and Climate". Romblon Profile. Calapan City: National Economic and Development Authority (NEDA) MIMAROPA Region. สืบค้นเมื่อ 9 September 2015. ↑ 7.0 7.1 7.2 7.3 "History". Romblon Province. Romblon Provincial Government. Archived from the original on 23 November 2013. สืบค้นเมื่อ 8 September 2015. ↑ 8.0 8.1 8.2 8.3 Geo-Physical Environment. Status Report on the Millennium Development Goals (MDGs) using CBMS data. 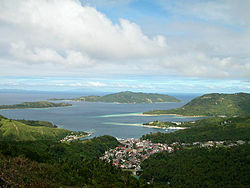 Romblon: Provincial Government of Romblon. 2010. ↑ Lasco, Gideon (26 March 2008). "Mount Guiting-Guiting". Pinoy Mountaineer. สืบค้นเมื่อ 9 September 2015. ↑ 10.0 10.1 Licap, Enzo (16 April 2013). "The Galapagos of Asia: Sibuyan Island". Choose Philippines. สืบค้นเมื่อ 2 May 2016. ↑ 11.0 11.1 11.2 Jebb, M.H.P. & M.R. Cheek (1997). A skeletal revision of Nepenthes (Nepenthaceae). Blumea. pp. 42(1): 1–106. ↑ 12.0 12.1 12.2 McPherson, S.R. (2009). Pitcher Plants of the Old World (2 volumes). Redfern Natural History Productions, Poole. ↑ Rickart, E.A. ; Heaney, L.R. ; Goodman, S.M. ; Jansa, S. (2005). Review of the Philippine genera Chrotomys and Celaenomys (Murinae) and description of a new species. Journal of Mammalogy. pp. 86 (2): 415–428. ↑ Esselstyn, Jacob A.; Goodman, Steven M. (2010). New species of shrew (Soricidae: Crocidura) from Sibuyan Island, Philippines. Journal of Mammalogy. pp. 91 (6): 1467–1472. ↑ Ong, P.; Rosell-Ambal, G.; Tabaranza, B.; Heaney, L.; Ingle, N.; Cariño, A.B. ; Pangulatan, L.M. ; Pedregosa, M.; Alcala, E. & Helgen, K. (2008). "Nyctimene rabori". The IUCN Red List of Threatened Species. IUCN. 2008: e.T14953A4482609. doi:10.2305/IUCN.UK.2008.RLTS.T14953A4482609.en. สืบค้นเมื่อ 15 January 2018. ↑ Kennedy, R.S. ; Gonzales P.C. ; Dickinson E.C. ; Miranda Jr., H.C.; Fisher T.H. (2000). A Guide to the Birds of the Philippines. Oxford: Oxford University Press. ↑ "Dicrurus menagei". IUCN Red List of Threatened Species. Version 2013.2. International Union for Conservation of Nature. 2013. สืบค้นเมื่อ 2 March 2014. ↑ Sánchez-González, L.A. & R.G. Moyle (2011). Molecular systematic and species limits in the Philippine fantails (Aves: Rhipidura). Molecular Phylogenetics and Evolution. pp. 61: 290–299. ↑ "Weather averages for Romblon, Philippines". Weather-Averages.com. Archived from the original on July 10, 2015. สืบค้นเมื่อ July 9, 2015. หน้านี้แก้ไขล่าสุดเมื่อวันที่ 13 เมษายน 2561 เวลา 20:26 น.